It is all cleared out and it may not be pretty to you, but we love walking in here now, because we can actually walk in here now! 1. If I didn’t use it this past year, into the Goodwill pile it went. 2. If I didn’t LOVE it, into the Goodwill pile it went. 3. If I was for sure, for positive, for certain I was going to use it in one of the rooms I’m planning to tackle this year, I took it to that room and stashed it in a closet, a drawer, or in the corner of that room so everything was where it was going to end up. Clear as mud? and for projects that are finished, I put the leftover paint in these locking plastic containers and threw out the cans. So much easier to stack, store, and grab for touch-ups. It may be the perfect place to set up our kitchen cabinet paint center….when I figure out what in the hey we’re doing with that. All of your suggestions are so appreciated~my list is HUGE of things/paint to check out. 1. how can I tell you all that “you can do it!” if I don’t even do it?? 2. We did it in our last home. C’mon, Melissa!! It was so much fun! Love the gift bins and left over paint storage. I painted my cabs myself and am getting ready to paint them again! I always dread painting but when I finish it always seems that it went more quickly and painlessly than I expected, kinda like having kids. You forget the hard part once it's over haha. Ugh, we just painted our kitchen cabinets and it was a huge pain. On the plus side, they look so much better that I don't mind what a hassle they were, and I'm thrilled we saved money by doing them ourselves. That is not a fun project, though! Store room or not, it looks great, Melissa! I know I feel better when I clear out all our "stuff" and get rid of it. Good luck with the cabinets. If we weren't planning on downsizing, I had wanted to do mine a cream color with a glaze. Of course you would do it! None of us want to spend "that" kind of money! ~and....it will be beautiful! Melissa, the storage room looks great!~I'm sure it feels so good to have it all cleaned out! I'm working on mine also. Love the way you've done your paint storage. My "black hole" of a garage may have had your storage room beat for a disaster zone...hopefully it will warm up soon, and I'll be able to put some of your storage ideas to use getting it cleaned out. My washer and dryer are the same way (backwards). It's because my "laundry room" (and I use that term VERY loosely) is in my garage. One side is blocked, so we couldn't put the dryer on the right hide side. LOL! The gift bin is a great idea!! I normally buy gifts and then shove them into a closet. Not a great system. ;) I had T take the world's ugliest chair out of the girls' room today, and it already feels so much roomier in there. :) Much better! Shari~thank you for that link! We used it for our new dishwasher (I didn't know I was getting a new washer and dryer! ), but Virginia gals, it is so worth the few minutes it takes to fill it out. I think it's only one rebate per household per year?? Thanks for sharing the pretty and not so pretty parts of your home so that we can all feel "normal" together. Is the washer and dryer really backwards? Mine are like that. I don't think it really matters. I hope not. snappy~I'm right handed, so I guess I always thought the wet wash should go from the washer to the dryer left to right? I guess it really doesn't matter, does it? Great job! I know you feel refreshed and empowered having knocked that out !! Painting the kitchen cabs will be a piece 'o cake! The cabinets will be great and if you have done this before!! Girl, you got this! :) Can't wait to see. I painted our cabinets by myself and they could stand to be done again, I plan on tackling that while my husband is deployed. I love the cream color! And I saved the money of course. Thanks for the bin idea for gifts. What a cool project to start the year! Our storage room is such a mess. DIY idea is not bad specially if you have a great eye for design. I like the gift storage boxes. Why haven't I thought of that. Keep em up Melissa! Looking forward to your finished work. We would love a washer/dryer set on our main level as well as the basement! We currently lug ours up and down to the basement and it can be a drag :-) Also in Virginia, and we just bought a slew of appliances when we moved in so thank you for the rebate link and info. We bought appliances where there were none before, so wondering if we would still qualify for the rebate?! You can do it! Of course you can do it! And won't you be glad not to be writing that check to the painters? Of course you will!! Girl, I'd have a washer and dryer on every floor of my house if I could. I don't think you're silly at all for keeping your old ones--especially with five kids! I think you're brilliant! Good for you! Only 12 days into the new year and you can check something off of your list! 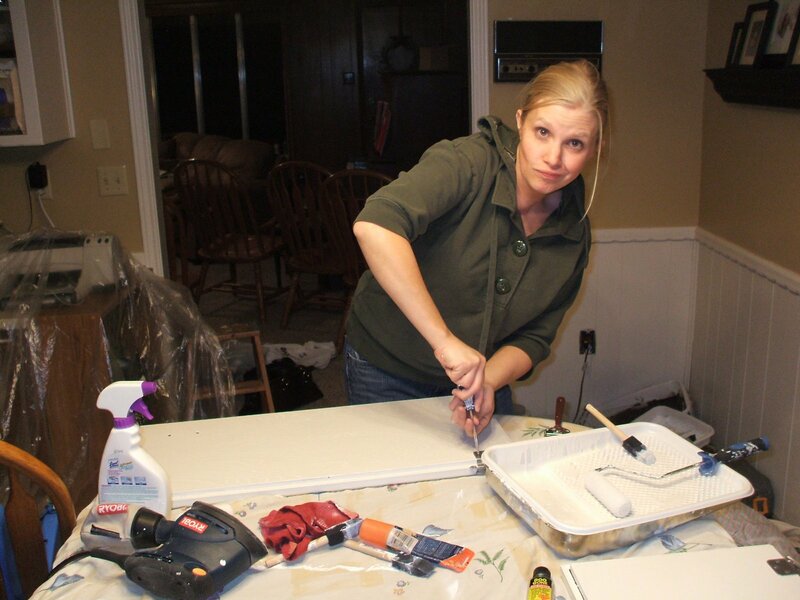 Your kitchen will look fab when you're done but yuck to all that sanding, priming and painting! Love the tip on storing leftover paint in tupperware. I need to do that. Ben & Serwin & Behr & Valspar all live here :). It looks so much better - you have inspired me as i need to clean out our shed! Good for you! My garage is HORRIFYING and is on the list for a nice new look as soon as it warms up a little bit... Way too cold right now! We stained our cabinets and they turned out great. Just plan at least twice the time that you think it will take. I thought it would take a week, but between sanding, staining, and multiple coats of varnish and drying times on both sides it took at least 2 weeks. Drying time (in the winter in WA) killed me! Well worth it though! Love your idea of storing the leftover paint in tupperware type containers. Does it really work and keep them from drying out? Wow, you have been one busy girl. The garage clean-up and this too!?!? You're putting the rest of us to shame!!! Looks great though, and I bet it feels really good to have it done! I so need to get down in our basement now that I've gotten all of the club's uniforms out of there!! I love the paint container idea...so need to do that and get rid of the half empty mega cans. Good for you for painting your own cabinets, I've done ours...it is a chore, but does save a ton of money!!! Love the basement!! I'm bribing my family members to clean out their spaces or more importantly, their things out of my spaces. Once we have a large rubbermaid container full for goodwill and another one full for the trash, we get a movie night complete with popcorn and hot chocolate. I hope it goes as well as yours did!! Now for my question ... I noticed your table saw in your nice, clean storage room. I'm looking for one for my board and batten project (inspired by 320 sycamore!). I got a nail gun and compressor for christmas, but I'm looking for recommendations for a table or miter saw. I have a miter block and hand saw that I've used for small projects, but I can't imagine using it for a big one. Any advice?? In looking at our front-loader washer and dryer, you can tell they are designed for designed for the sort of flow you're talking about; the washer door swings open to the left, the dryer to the right. But we've used these same appliances in two houses, and in both places the water hookups were on the right and the vent to the left. And I'd never even thought about it before. Huh. Odd.